Earlier this year at the 2010 Geneva Motor Show Skoda unveiled the facelifted edition of the Skoda Fabia and even hinted about its entry in the Indian automobile market in the later half of 2010. 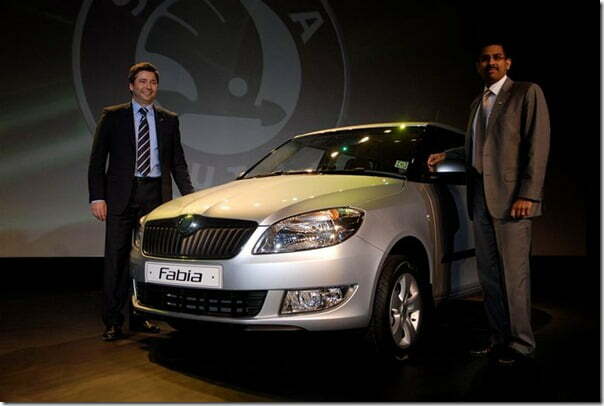 Keeping the promise the company has announced the launch of Skoda Fabia Facelift. The car in spite of offering a host of features and extremely safe and rugged built did not work for the brand because of its high pricing. But now that the brand is ready with a new facelifted version sporting a new engine, with a more affordable price tag. This price tag cut is mainly because of the use of more and more locally sourced automobile components used in the new Skoda Fabia. The car gets a few minor changes on the exteriors and interiors as well but the most unique thing about this car is the new and more powerful 1.2 Litre, 75BHP MPFI Petrol Engine, already coming with the Volkswagen Polo. Apart from being more powerful the efficiency and emission rates of the engine are also better than the previous 1.4 Litre TDi one. The best part is yet to come as all those who would consider buying this car at Diwali but are disappointed with the power then my friends i must tell you that it also be offers a 1.6 Litre MPFI Petrol engine as coming with the Volkswagen Vento. Other prominent features include larger headlamps and a sharper radiator grille. We think the car is all set for the go and hope that it does bring about some changes. This means the on-road price of the new Fabia will be approximately between Rs. 5 Lakhs to Rs. 7.5 Lakhs in Delhi for different variants. Mumbai: 12th October 2010: ŠkodaAuto India, a fully owned subsidiary of ŠkodaAuto a.s., Czech Republic and one of the most promising automobile companies in India, today announced the launch of the new Škoda Fabia. The all new Škoda Fabia offers a complete new package boosted with plush interiors and dynamic exteriors, innovative features and engine technology. yet accessible price range with an improved value for money proposition. We are confident that the New Škoda Fabia will surpass the expectation of all and will be received well by our customers”. The launch of the new Škoda Fabia emphatically enunciates recently appointed ŠkodaAuto BOD Chairman Prof. Dr. H.C. Winfried Vahland’s growth strategy of further reinforcing Škoda’s presence in markets that offer a good potential for growth by extending product portfolio to get to new segments to result in profitable growth..
1.6 MPI (Petrol) – available in Elegance variant. The New Škoda Fabia is available in three engine options; 1.6 MPI, 1.2 TDI CR and 1.2 MPI. 1.6 MPI – : The best performance in its class, it is an absolute delight for a spirited driving experience. It is equipped with 1598cc engine, 4 cylinders which generate 105 bhp at 5250rpm. 1.2 MPI – Smooth and silent performer with improved output, comes with 1198cc, 3 cylinders, MPI engine which generates 55-75 bhp at 5400rpm. The smooth and peppy engine delivers quietly and economically, which suits most urban applications. 1.2 TDI CR – One of the most fuel efficient diesel motor, features a Turbocharged Direct Injection Common Rail 1199cc engine which generates a maximum power of 75bhp. With its low fuel consumption it is an ideal car for the high mileage user. All the variants of the New Škoda Fabia are geared with a Manual 5-speed transmission, which suits the cut and thrust of the city traffic ensuring a better driving experience. The exterior of the new Škoda Fabia stands out for its robust and dynamic design. The well- defined creases along the front bumper with the sharp lower outline, wider air dam and the protrusion of the front grille combine to give a sporty frontal expression to the car. The elongated headlamps and fog lamps stretch outwards to the sides and define the width of the car. The Rear combined lights with their characteristic C-shaped translucent tail lights, reflects the Škoda DNA all the way. The interiors too are enlivened with high quality detailing with premium appointments comprising of chrome decor, ivory colour and soft-touch dashboard. It enhances the visual and tactile impression of the car. Also the new checkered upholstery makes its debut with the new Skoda Fabia which adds to the overall premium feel of the car. The New Škoda Fabia is armed with Airbags for all models – including dual airbags starting from the mid version. Unique to class advanced Safety features like ABS (Anti-lock Braking System), EBC (Engine Braking Control) and Dual Rate Brake Assist, adjustable seat belts and child proof door and window locking ensure utmost security for the driver and passengers. The New Škoda Fabia is the epitome of comfort. It is truly the best in terms of the ample legroom and headroom space offered in a hatchback. The height of the driver’s seat and the steering wheels arrangements (height and length) can be adjusted as per the driver’s convenience. The Multi function display gives the driver a regular update on the distance travelled, average speed, immediate fuel consumption, average fuel consumption, travel distance before refueling, service interval, outside temperature etc. The three variants of new Škoda Fabia are available in an aesthetic array of colors- Cappuccino Beige, Brilliant Silver, Candy White, Deep Black and Flash Red.